The market gapped up again today in what seemed like it was going to be a bullish W3 but as soon as it hit the rounded top trendline the wave reversed again overlapping the previous impulse wave and closing the day in red. And now that we have all these waves in place, I am labeling them a double zig zag to form a B wave and we should see a bearish C wave coming as soon as tomorrow to test 1676. 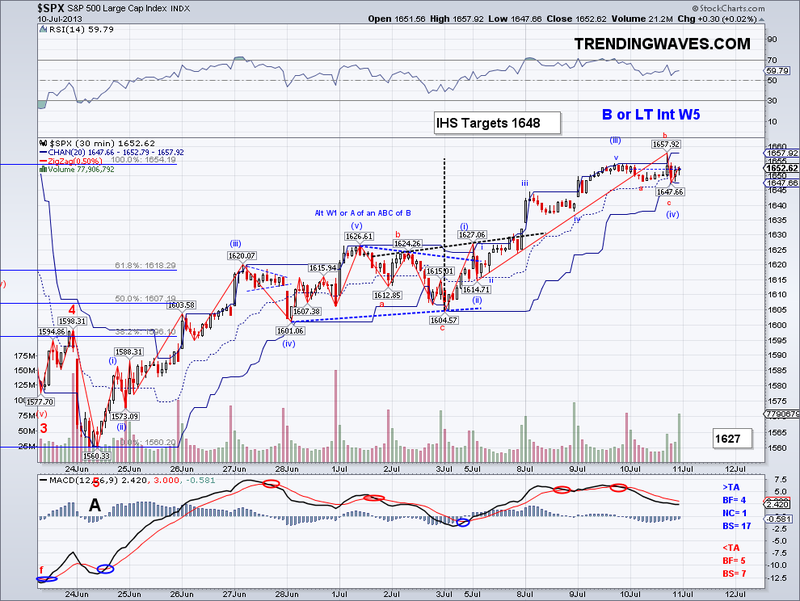 However, if we go by the wave I have labeled as W1 from 1698 to 85, then the 5 count projects to around 1660-65 which happens to in the area of 1.618 of A wave. Also, the 50 day ma is at 1646 and rising a few points per day so that might ultimately be a target as well. I ended up holding to my VXX but did not add so the plan now is to sell at a profit (hopefully since one never knows with this thing!) 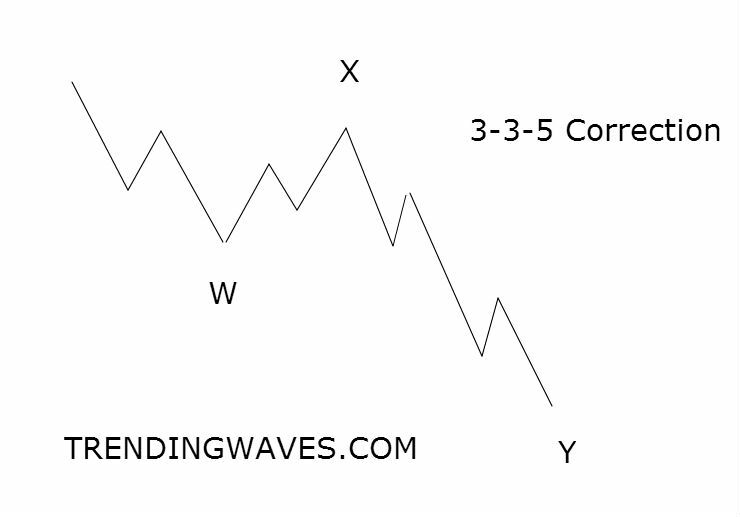 at the completion of the 5 waves and load back up with SPY. And from now on I will be trading VXX only at 5th wave completions, it is crazy to see the VIX shoot up while this thing goes down with a mind of its own. * Trends are not trade signals. 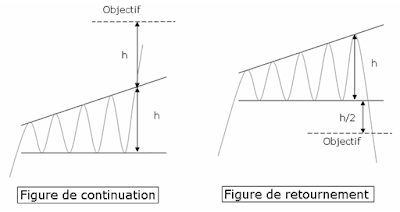 Trends are posted for situational awareness only and does not take into account wave counts, technical or fundamental conditions of the market. While mechanically trading the posted trends is feasible, keep in mind that these are lagging indicators and as such are prone to whipsaws and I personally do not use nor recommend them to initiate or close positions in the market without taking into consideration other factors. The market seemed like it was on its way to break out of its range early morning but the bullish wave got stopped at the IHS neckline trend and reversed to test the low from yesterday and managed to put in a slightly higher low. Which technically still keeps a 5 wave count alive on the SP500, however the DOW made a lower low so it will be interesting to see how these two counts will end up reconciling. The market could be putting in a triangle or just getting ready for stronger wave down but I think it all comes down to the 1676-1682 level holding. If this level holds, the market should make an all time high soon. With that said, the daily MACD is about to roll over on the daily so any new high will likely be reversed. Lastly, today is the second day the marker closed under the Trend Average so the Short Term trend will go negative should a stronger bearish wave appear. I ended up buying back VXX at a much better price at the break of the micro 5 wave count (1687) and sold the longs I bought yesterday for a minor profit. And the plan is to buy longs again at the test of support again or just buy the other 50% of my short position if a break out wave appears. A bigger correction is coming sooner rather than later. 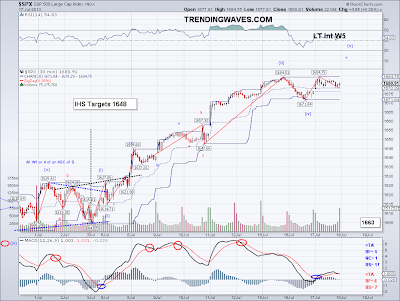 The market corrected and put in the low of the day in the 1680-82 range I mentioned on my post on Friday and now we have an Inverse Head and Shoulders set up targeting 1706. Obviously there are other options available which includes the bounce wave being part of the final leg of a B with a C to come to test the 1676 low or a bearish nested 1-2 set up. 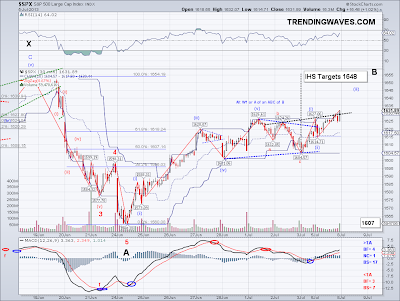 But I usually tend to favor and trade one count so I am going with the IHS set up until it is proven otherwise. The great majority of IHS patterns this year have been completed (I can only think of a couple of times where it did not) so maybe this one will too. I ended up selling the VXX position to position trade as planned, so I will be buying back the position on (hopefully) the completion of a 5th leg. Also I went long at the low of the day and this time I bought SPY which tracks the index directly unlike that crazy VXX. Btw the reason I buy VXX sometimes it's because I want more "bang for the buck" and the fact that my account does not let me buy triple or double leveraged ETFs on margin. My core capital is 100% invested in long positions since last year and those are rarely traded. The trades announced here are done with the margin offered on one of my accounts. And apparently, one can buy volatility (which is as dangerous as the double and triple ETFs) but one can not buy anything that is further leveraged. So that gives me the options of SPY, SH or volatility. In the end, more than making money on the margin account, I am real time testing all these trade combinations to see which one yields the highest return on capital being risked. If I can get a consistent 10% + annualized on capital risked I'll be very happy, 20%+ I'll be ecstatic.. Warren Buffet, who is without a doubt (in my mind) the best investor that has ever lived has an average return of 20% on his holdings. 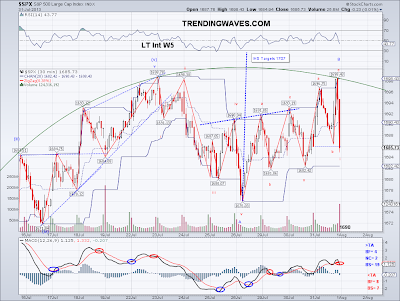 So one side of me tells me maybe we can beat this 20% using these TA tools and wave analysis together but at the same time I am well aware it is a very long shot given the fact that few Wall Street professionals even come close (never mind people who use traditional TA tools or Elliott Wave). But one never knows without trying, so maybe all this real time testing and effort on deciphering the markets will yield a clear advantage. I guess we'll find out in a few years where I will have enough data to compare to other methods. 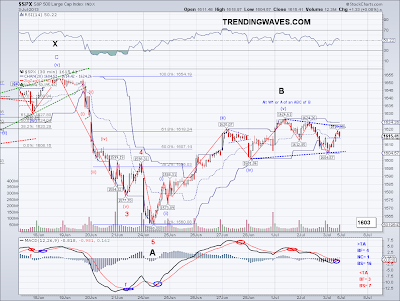 The market put in another lower low today before putting in a bullish reversal and I adjusted the wave count to reflect this move. 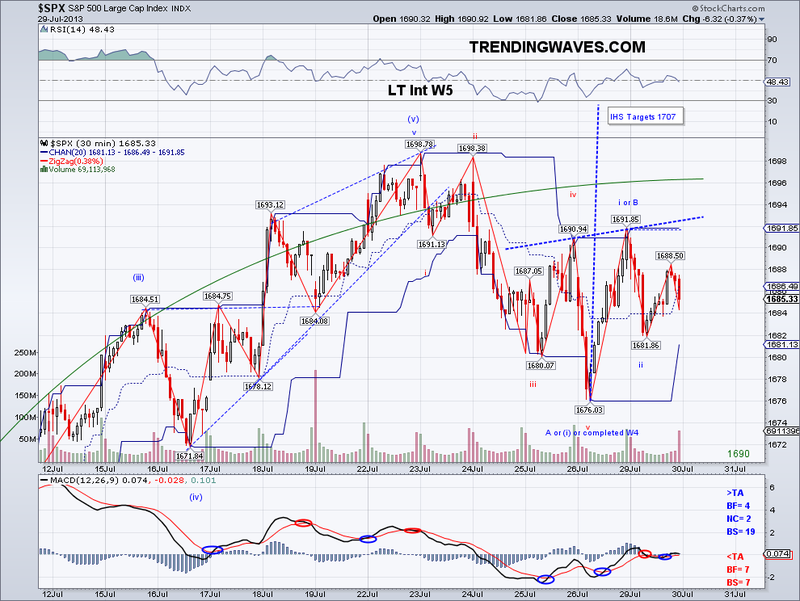 I overlooked the fact that 5 waves yesterday to the 1680 low were part of the W3 and not the entire count so now that we have the new labels we can speculate on what's coming next. 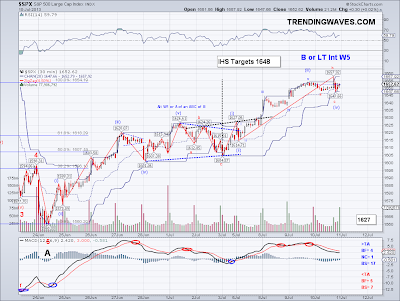 Basically, I see the bearish potential in that there is an Head and Shoulders targeting 1655 and the rounded top trendline (technically speaking the rounded top already took place when the correction started earlier this week), which would imply the correction is a W2 of LT Int 5 of LT W3. At the same time, the market has kept up with the Trend Average by re-capturing it and closing above it and leaving the potential for an Inverted Head and Shoulders at the test of 1680-82 (assuming we see a retrace of today's wave on Monday or Tuesday). 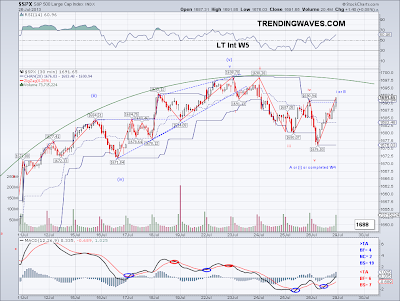 Which implies W4 of W1 of LT Int 5 is done and we are in the early stages of W5 of W1 of LT Int 5 and if this is the case and the first wave topped today at 1691, I project a target area of about 1715 for this final wave of W1 of LT In W5. My VXX position is performing poorly despite the market correcting but I will position traded it hopefully at the test of 1680-82. 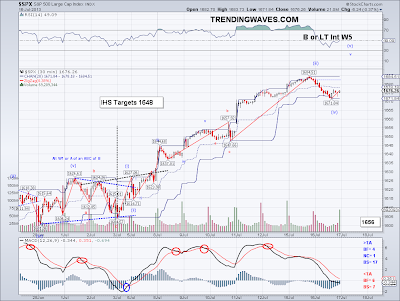 I am also planning to add longs at 80-82 in case we are getting an IHS with a stop at 76. Last but not least, thank you for voting on the sentiment poll (Trending Waves Sentiment Poll). Once the week is over, I will add a recap of the wave to the post and this way we can compare what sentiment is like during each particular wave. I think this poll is more valuable than the usual sentiment polls in the sense that most people voting have TA and EW knowledge so we'll see how this evolves during the next few months. Maybe certain waves will have particular sentiment characteristics? The market put in a lower low at 1680 (which was the main projection from couple of days ago) to complete a 5 wave structure from 1698 and now we have to see if that was the A leg of an ongoing correction or a complete Minor W4 correction. We've seen these relatively fast corrections this year so the possibility is there that a new bullish wave is already taking place for a final 5th Minor wave. So for now, I am watching that rounded trendline to confirm a deeper correction or a breakout that will confirm a 5th wave. I position traded VXX today as planned but still keeping it in case we are going to see a bigger sell off and maintaining all my long positions intact. Also, I wanted to announce this new forum I created to better track market forecasts and share trading ideas. There is currently a poll I created to get an idea of general sentiment. I want to see if there is any correlation between sentiment and a particular wave so we can take it into account in the future. So please take a minute to register and vote. The market came really close to invalidating the 1-2 count I speculated on yesterday by putting a high of 1698.38 but by early morning the market started to sell off confirming some sort of top yesterday by coming down to test the Trend Average as I had been expecting. The main question now is the degree of the top as we could label the move today to 1682 as an ABC or an 1-2-3 with more downside to come tomorrow. 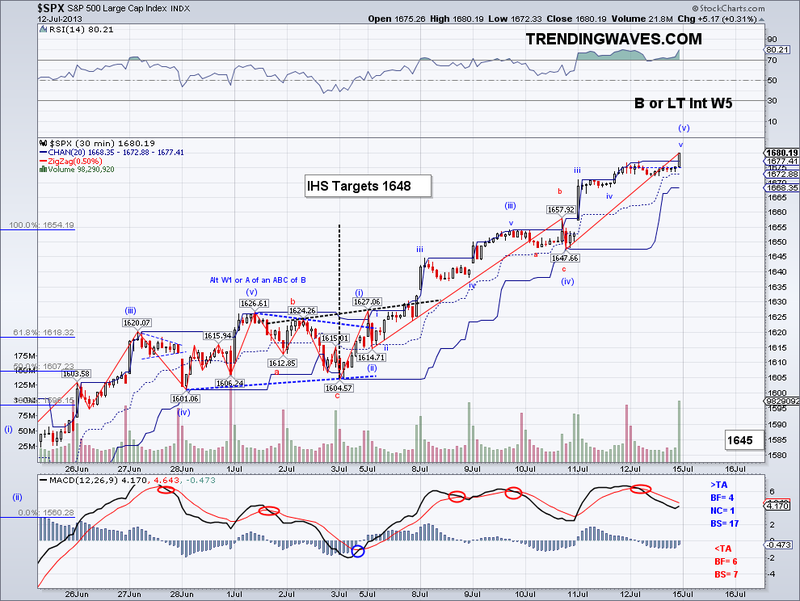 For that I am looking at the Trend Average which rose today to 1686 and the market closed just below the TA. The first close below the TA in almost a month so we'll have to see if the market can recapture the TA tomorrow, if it doesn't then it means the correction will continue. Last but not least, keep an eye on the rounded top trendline as any bounce should be held below it for a continued correction. I am holding VXX which is underwater despite being "right" in buying it at 1690. 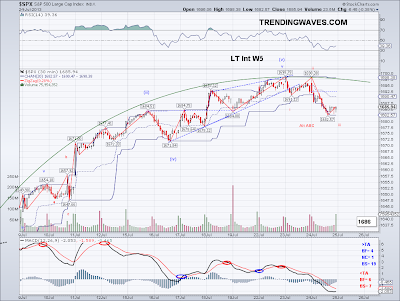 But I will position trade if the market starts trading above the TA again. This ETN is a tricky trade as sometimes it doesn't correlate well to the market or the VIX for the matter but at the same time it can be very rewarding if one is patient. The market made a marginal new all time high today and there is a chance this could have been a top. Looking at the micro count I see an impulse down and a corrective wave, so a possible 1-2 which targets 1680 more or less. Obviously, this count will be invalidated should the market make it past 1698.78 so we'll see if we get a bearish impulse in the next couple of sessions. 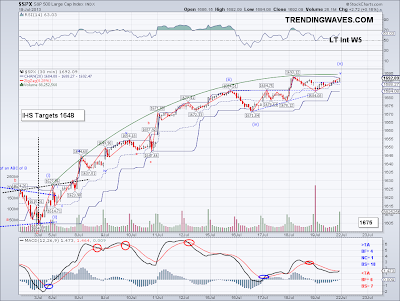 The Trend Average has risen to 1684 and it will be interesting to see how that holds. 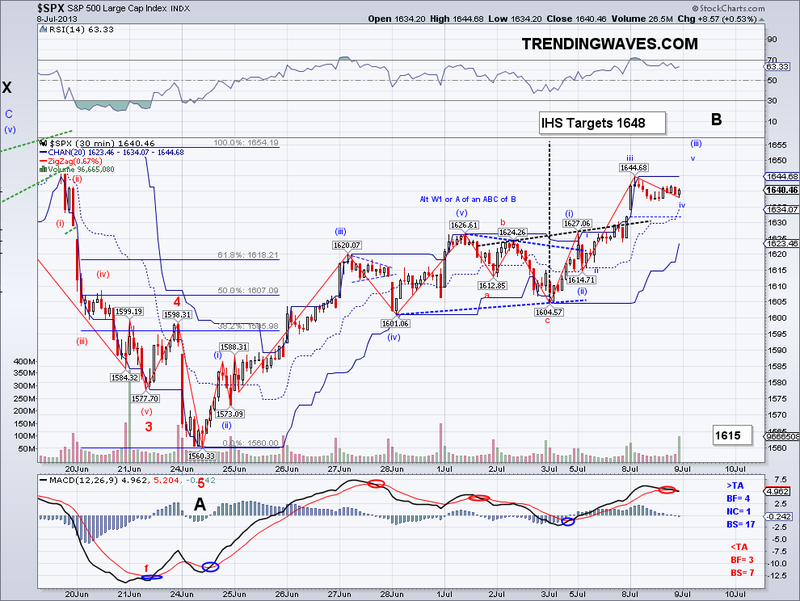 If the market is able to stay above the TA, then 1700+ will almost be a given. Who would have thought the day the market hit 1560 that this thing would shoot straight up on technically no news (with the exception of Bernanke comments last week), just like the market reversed in May at 1687 on nothing as well. 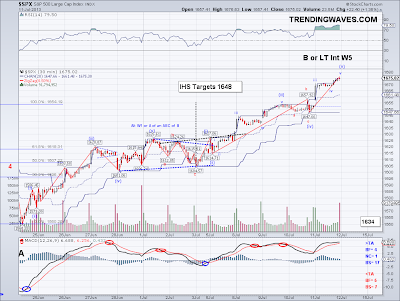 The market made another all time high today and it met the Ascending Triangle target from last week. And it seems to me like the market is getting very close to rolling over to start a correction but there might be some strength left to reach the 1710 level, there are divergences all over the place and the market needs a good base to rally from again. So I think we should see the end of this wave this week or next at the latest. As you know I don't normally like calling tops in a market with no resistance but euphoria has its limits, so we'll find out soon. I am holding on to my VXX position but won't be adding the other 50% unless we reach 1710. 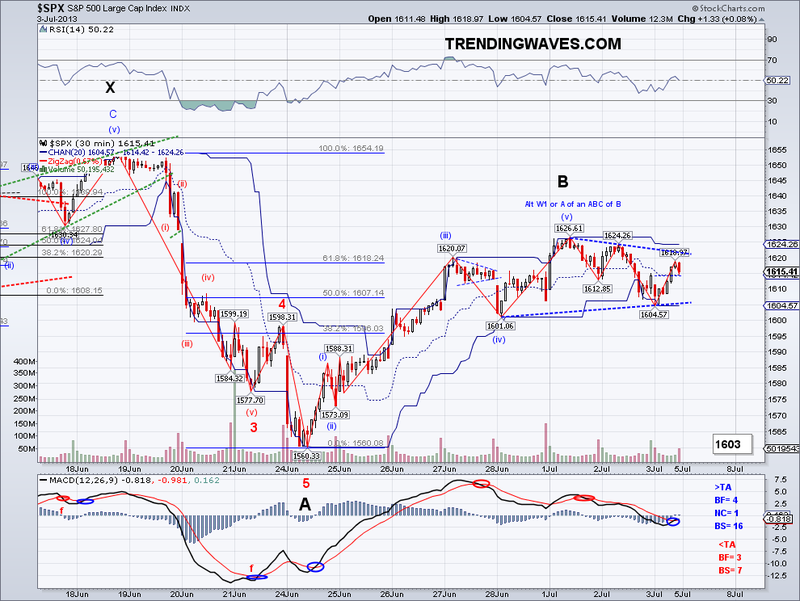 The market traded sideways today in what seems like a slow moving Wave 5 on the micro count. However, looking at the pre-market charts the count on the cash market was technically invalidated yesterday so we now have a small divergence in counts at the micro level. 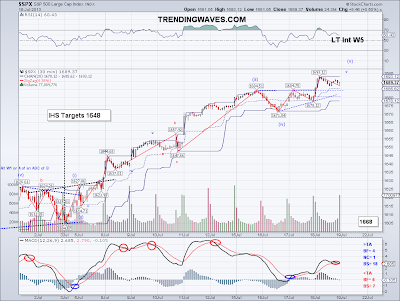 Therefore, the market could have topped at 1693 and the pattern looks like a potential rounded top. This particular pattern is not a very reliable one but we can be prepared in case the market continues to trade under the rounded line on the chart. 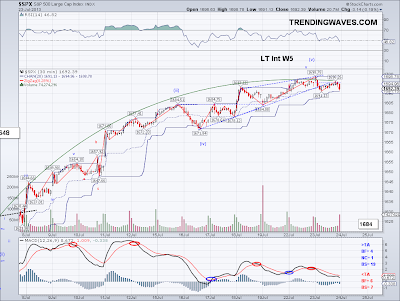 Also one thing I wanted to point out was the W5 of LT Int W3 looks very similar in size and look to the current wave from 1560. 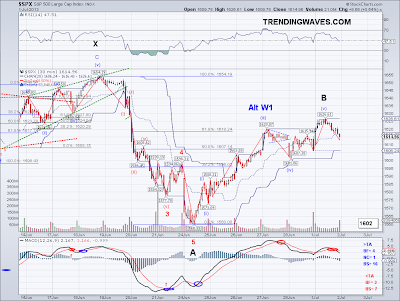 The main difference is that wave was 151 points and this current wave is 133 points, so a rise to 1710 which just so happens to be 1.618 of 1626-1560=66 would make it nearly identical to that W5. I've seen these odd coincidences in the past so I wouldn't be surprised if that is what the market is looking for. An ideal top would come in the form of a very bullish gap to that target level and then a sudden reversal, which is what happened on the day the market topped at 1687 in May. I bought VXX today using 50% of my short/hedge position. 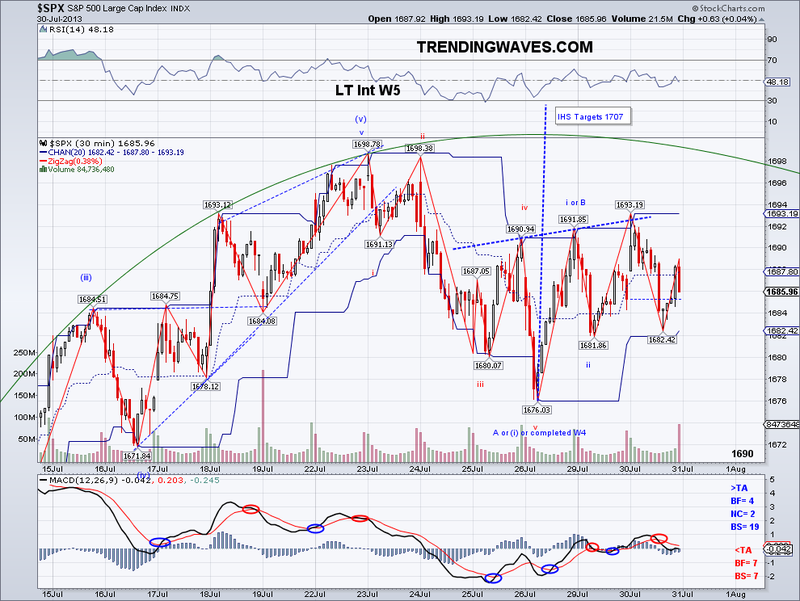 So if the market makes it to that 1710 level I will add the other half. 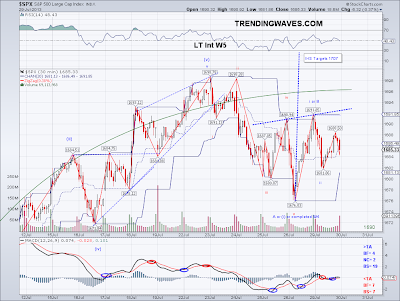 The market reached an all time high as I had been expecting now for a while and this moves confirms the LT Intermediate Wave 4 was the WXY move from 1687 to 1560. So now that we got out of the way, the game plan will be to catch a good trade set up to enjoy the rest of uptrend for the next few weeks or perhaps months. The current structure from 1560 is currently 133 points with negligible corrections and it seems like the next substantial correction will be a W4 that will be followed with a W5 targeting 1700+. 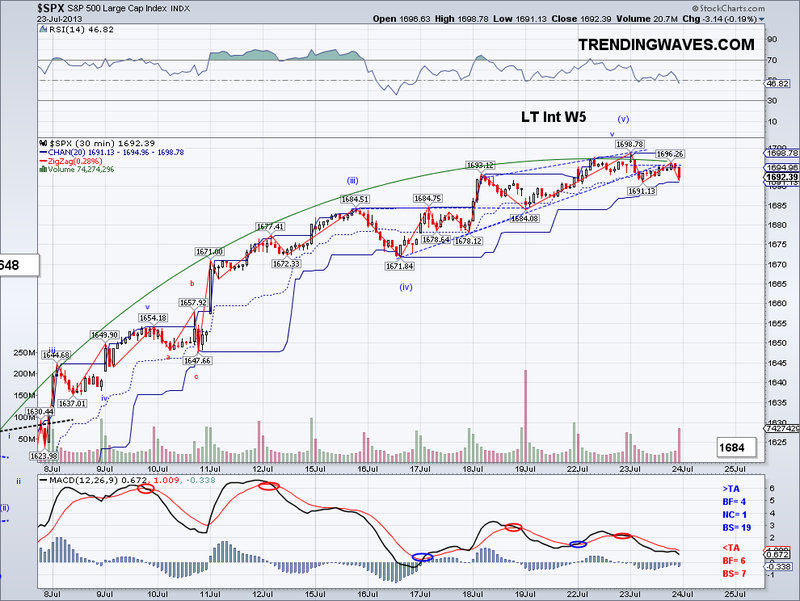 So perhaps the market is close to the W3 peak and we will see a W4 start sometimes next week? 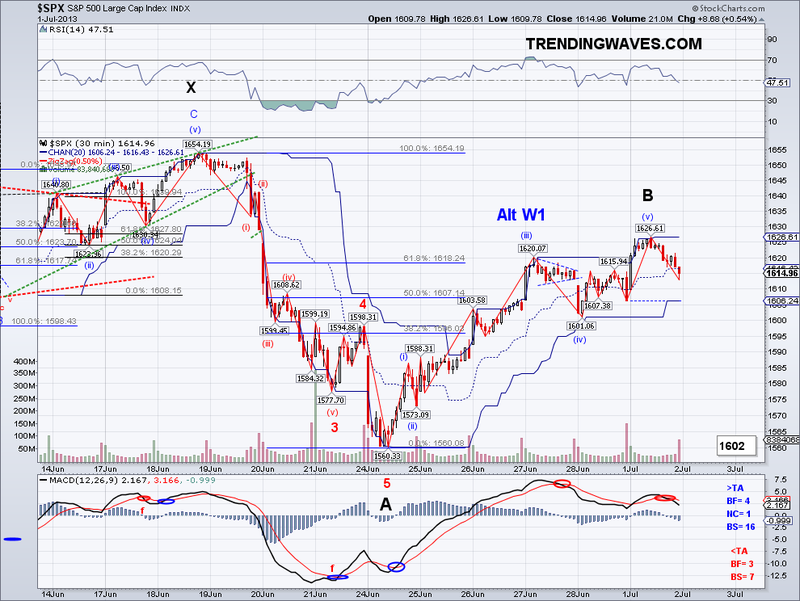 I'd like to short a 5 wave completion but it will be very tempting if the market makes it to 1700-10 level. We'll see what the market does tomorrow since tech will probably drag the market after Google and MSFT earnings results. And Google btw is probably the one stock I would feel comfortable holding for the long term out of all tech companies so I might just buy me some Google on the correction. As this world becomes more tech oriented, Google will be grabbing a huge share specially since Yahoo and Bing/MSFT will continue to fall further behind. The market didn't do all that much today despite Bernanke's remarks and it seems like the market has been correcting more in time terms than price so we should see the resumption of the rally soon. 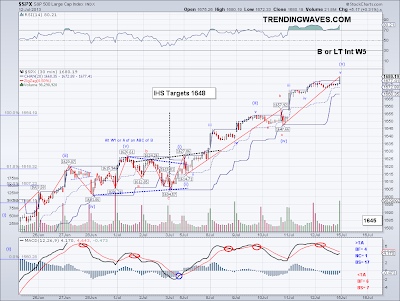 The Trend Avg is now at 1663 and soon will catch up to the market, which is a very bullish sign. The last time the market refused to test the TA and instead "waited" for the TA to catch up was in January when it was in the high 1400's and where many "professional" traders got caught off guard shorting. So unless the market goes down substantially tomorrow, I think the market is about to take out the all time highs. 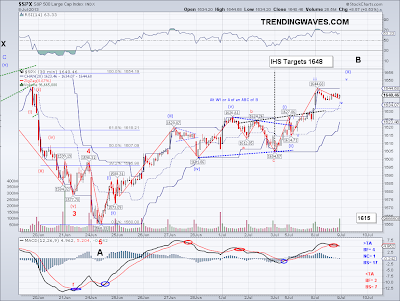 Lastly, the market could be putting in an Ascending Triangle targeting 1696 on a break out. I continue to stay on the sidelines to wait for a short term opportunity. 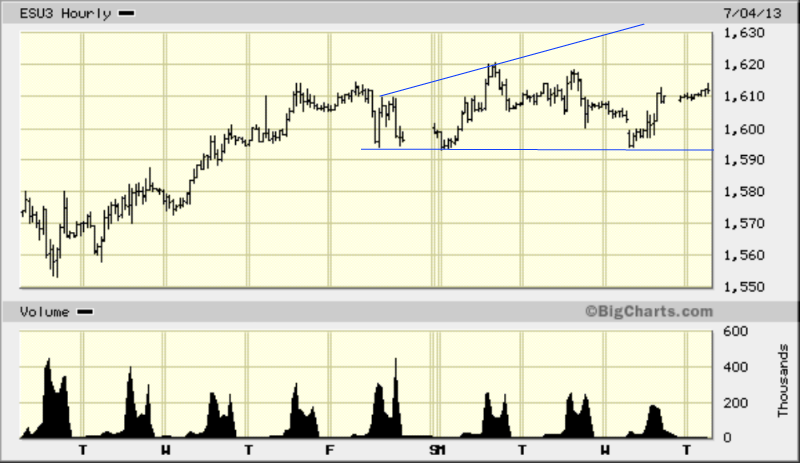 My longs are looking a little better now so hope they will stage a big rally soon to break out of its range. 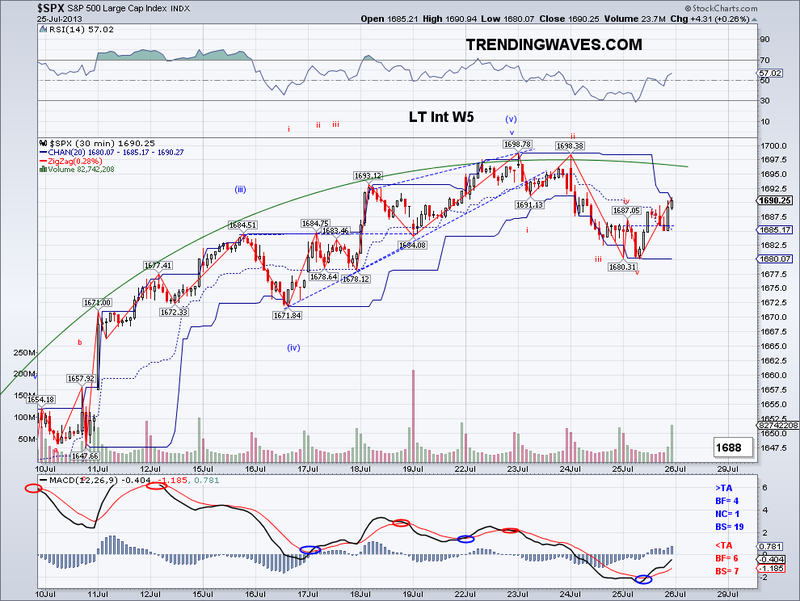 The market seems to have put in a W4 today that could technically still have some more downside. But given the advance in the past couple of weeks, I doubt we'll see any substantial selling. So I am expecting the rally to resume soon and make a new highs before going into any meaningful correction. The market seems to be very focused on what Bernanke has to say more so than earnings, so as long as he is seen favoring more QE the markets will be happy. I continue to stay on the sidelines on my short term trading as I want to see a lower risk/higher reward set up before taking any positions. The market continued it's slow ascent to an new all time high and the SP500 is only 3 points away while other indexes like the Russell and Wilshire have reached new highs already. I am assuming there will be short covering if 1687 breaks so that should probably put a leg to test 1700 and perhaps that will be the time to buy back the short I had last week. So for now I am on the sidelines on my short term account and staying long on my core portfolio. The market has now rallied 120 points from the 1560 low with a minimal correction in between. In fact, the market has had just 2 slightly red days vs 11 bullish days in the last 13 sessions so what started as a counter rally has turned into a full on euphoric rally. The 30 min MACD crosses that I track have had 3 bearish cross failures in a row, which hasn't happened in almost 3 years that I have been tracking it. So I think the bulls control the market and we're officially on the first wave of Int LT W5, which if correct will put the market comfortably in the 1800's or even 1900's before we see a substantial correction. So for now my focus will be on going margin long on the correction, which hopefully will come after another all time high is set. I mentioned couple of weeks ago when the 1597 level was breached to not to get carried away too much with the bearish case as all of this had been expected on the LT Count but I didn't think the market would be challenging the all time high in just 2 weeks time. So much for all that doomster scenario.. ironically, Marc Faber was calling for "taking money off the table" (as if he was actually long all this time) and Doug Kass was sounding alarms about earnings just earlier this week.. Anyway, I ended up covering after the market seemed to have found support at 1674 so lost a few points there but will be trying again this position if we hit 1710. I rather skip these small W4s after all these MACD failures. 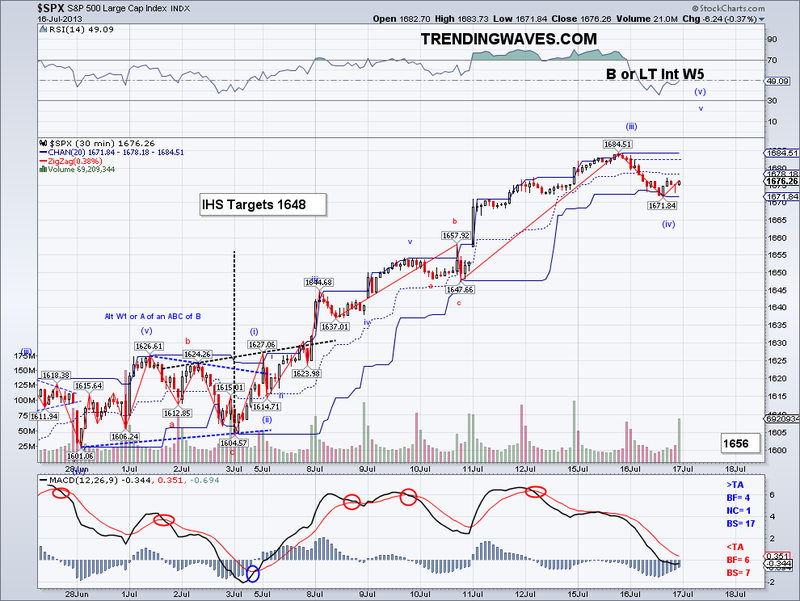 The market gapped up today as expected and reached the 1674 target and some more. 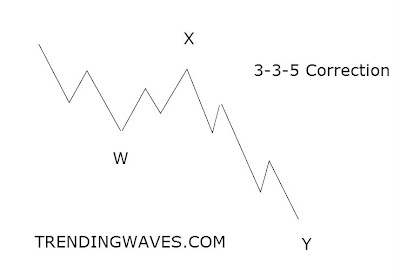 I see enough waves to start at least a W4 correction but I think it's about time for the market to put in a stronger bearish wave to digest gains and then continue the run. There has been 3 bullish gaps in 1 week and the SP500 has gone up 60 points from the day I changed the short term signal to bullish so the market is very overbought. 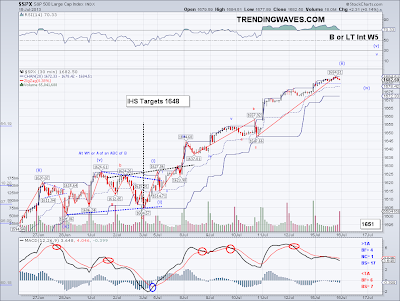 However, since 1687 is so close, I wouldn't be surprised if bulls make a run for it. 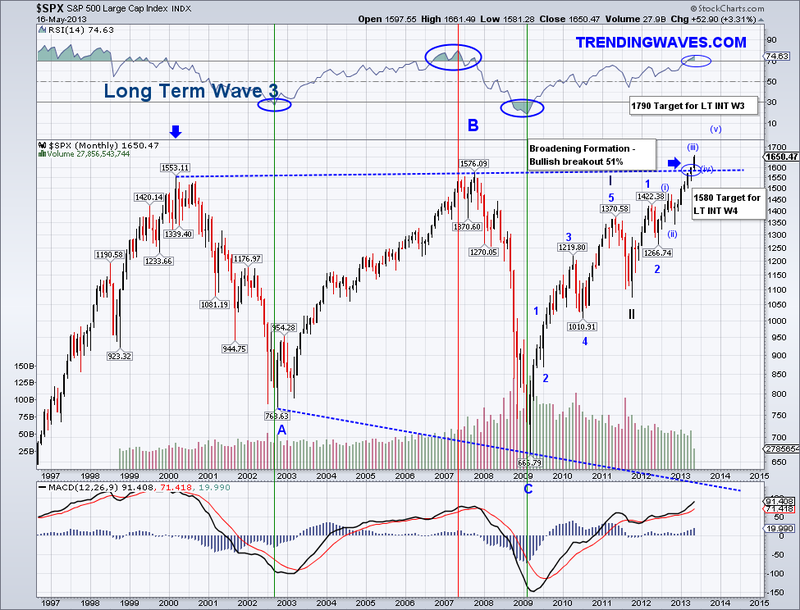 Whatever the case, what I am focusing on is more on what will the next bigger bearish wave will do. A test of the 50 day ma would be ideal and that is currently at 1630 so a proper Fib retrace would get the market there and allow traders on the side to jump in. I am hoping to see the 50 DMA hold and go margin long there (meaning adding new longs to my current long position) and perhaps see 1800 by the time we get another substantial correction. Right now the chances for this wave from 1560 being a B are very slim and I am leaning towards labeling the entire move from 1687 to 1560 a 3-3-5 correction as posted above. 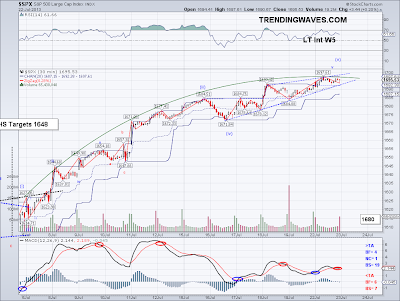 The intermediate trend changed to bullish today as well so that favors a bullish run that will last for quite some time. 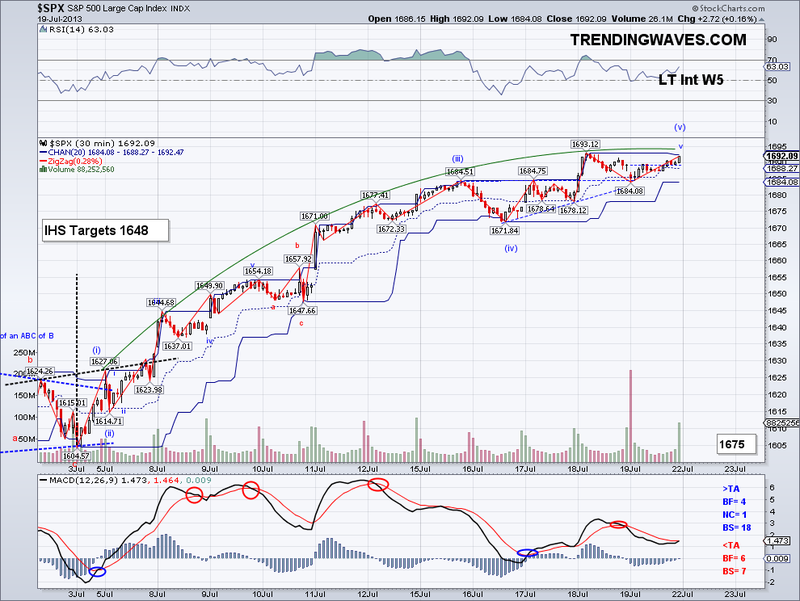 I shorted at 1673 per my plan from yesterday so hopefully we'll get a bigger corrective wave soon. Even if the run continues I will probably continue to hold shorts until I profit since my longs are overcompensating for any downside from the short position. The W4 I had been expecting could have technically occurred today as the market seems to be on a W5 already. I was hoping we would get a retrace to 1637 but instead we only got a very shallow correction with a low at 1647. 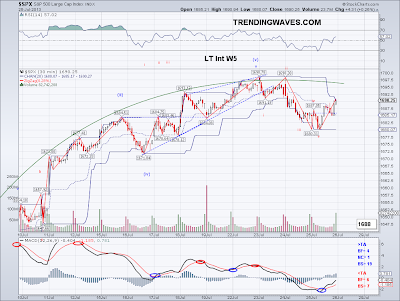 So going by this W4 low then the final W5 should target 1670 going by W1=W5. 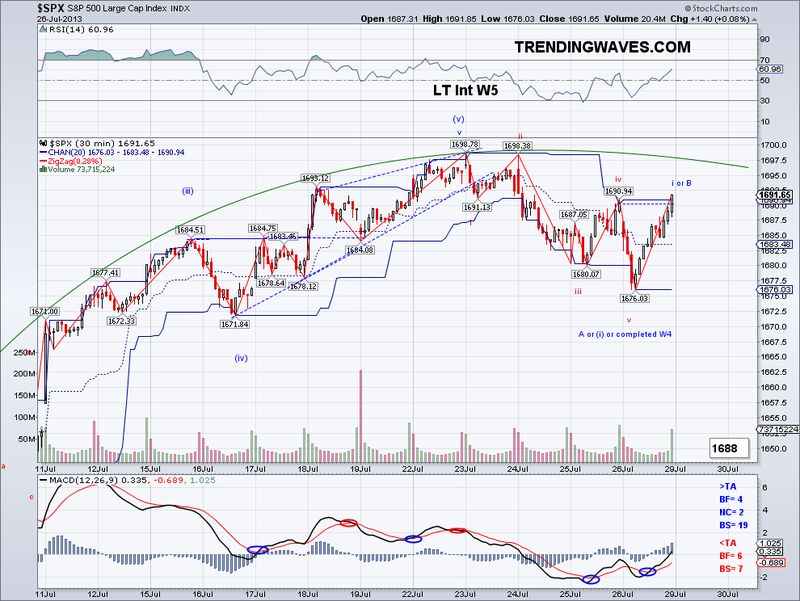 However, W3 could also be extending in which case the top of the entire structure could be going for 1687 or higher. 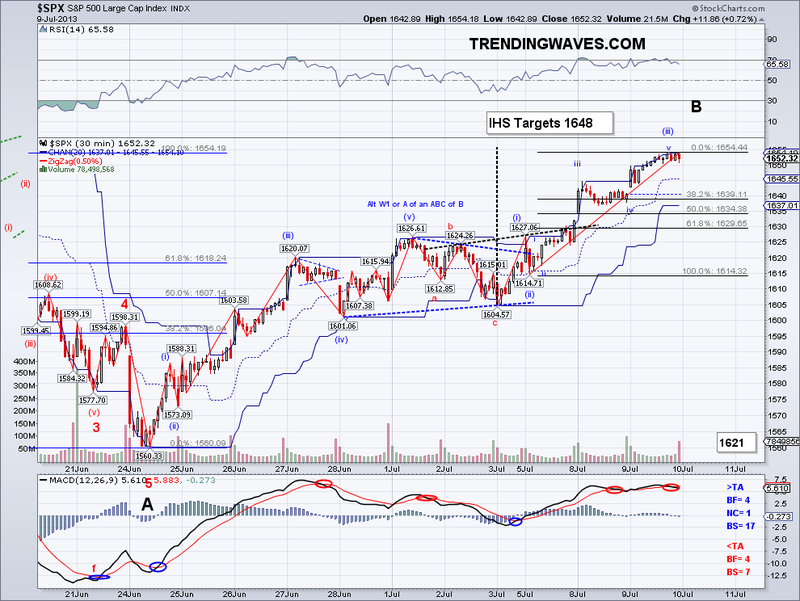 If we look at the first impulse from 1560 to 1626, we get 66 points and if this is indeed a B wave then 1604 + 66 =1670. 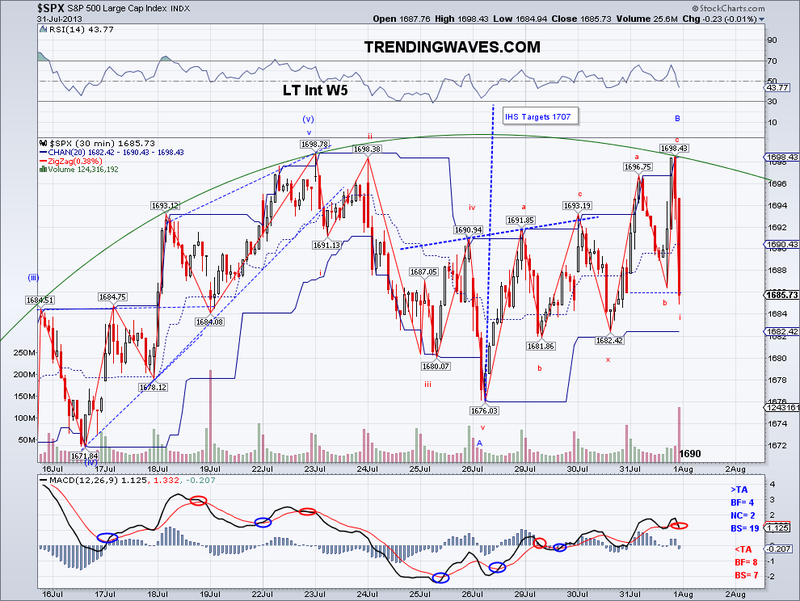 However, if what we have is actually part of the LT Int W5 then we get 1710 and the current wave would be a W3. 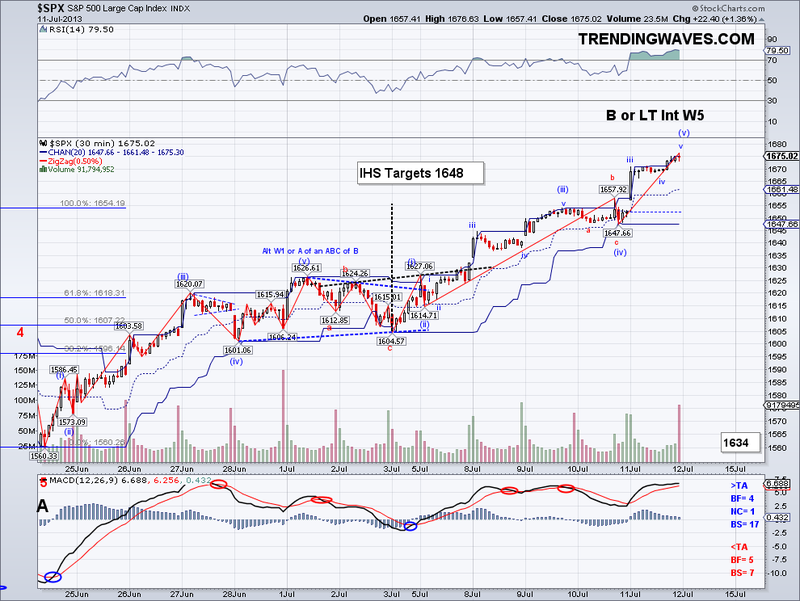 So anything going substantially beyond 1670 increases the odds of a W3 and obviously breaching 1687 would confirm it. I went short yesterday at 1649 and unfortunately got stopped in after hours once it became obvious the W4 was already in. But at least the longs make up for any short pain. However I will be buying back the short position possibly at 1674 if it makes it there or just go margin long when the entire structure does a Fib retrace. I don't think anyone could have predicted this big of a really in 2013 based primarily on QE but this is what the market wants. In a way more so than real economic growth which I find somewhat bizarre but I will go with the trend until it tells me not to. 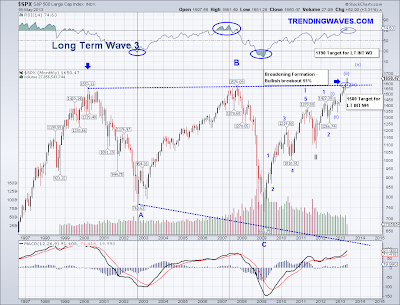 At this rate I am starting to doubt the coming bearish wave will be able to break the 50 day ma support. 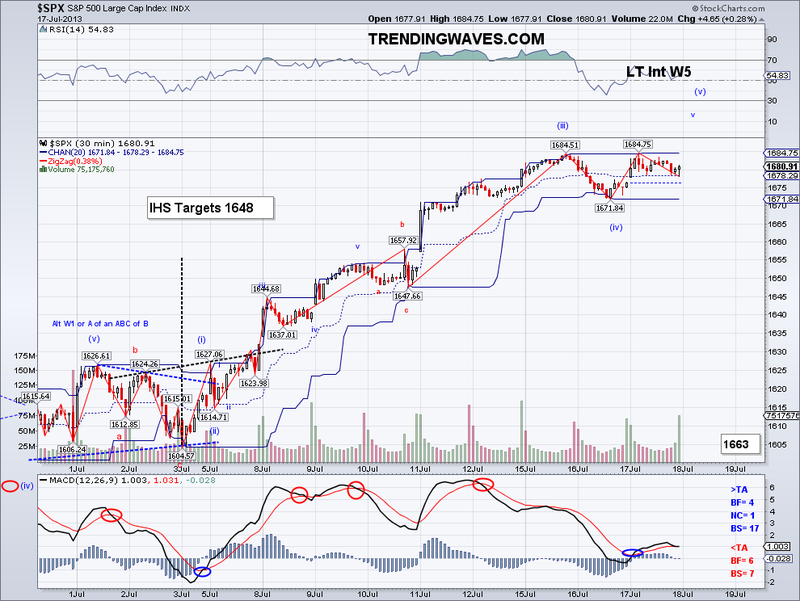 The IHS target I had from last week was met today as I had been expecting from the micro count yesterday and the W3 seems to have finalized at the 1654 high today. But should the market break this resistance, the next stop will be 1661 but for now I lean towards the start of a W4 correction starting as soon as tomorrow to 1637 more or less and then a final W5 to 1660's. 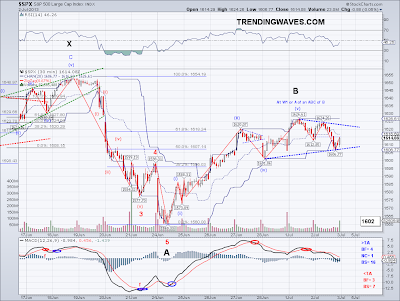 I wonder sometimes what are the odds of predicting these market moves without the help of wave counts, I assume without wave counting it'd be extremely difficult to be consistently profitable as a short term trader as there is nothing that can project levels as accurately in my experience. So if you are a mathematician feel free to calculate the odds as I'm actually very curious about the comparison. 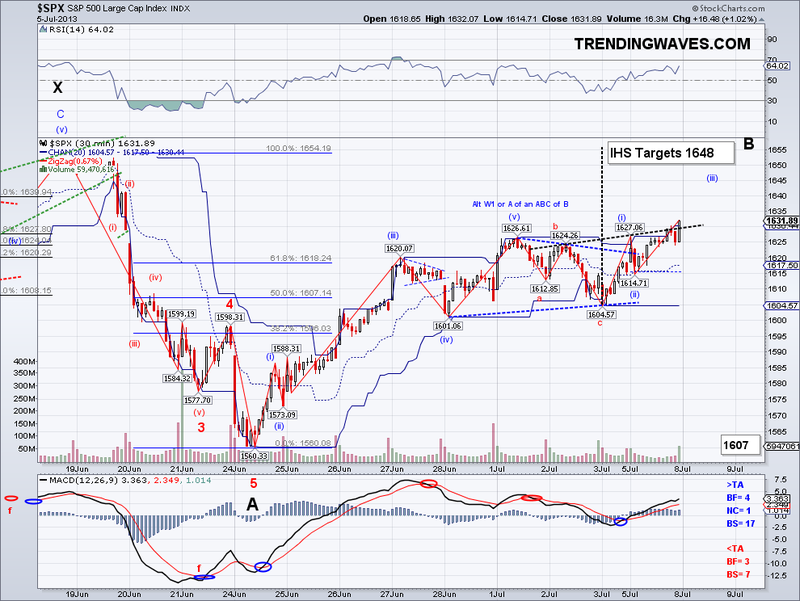 Inverse Head and Shoulder target to be met tomorrow? The market gapped up today as I had been expecting and looking at the micro count it looks like it might gap up yet again to meet the Inverse Head and Shoulder target of 1648 and the end the W3 of the count I have on the chart. 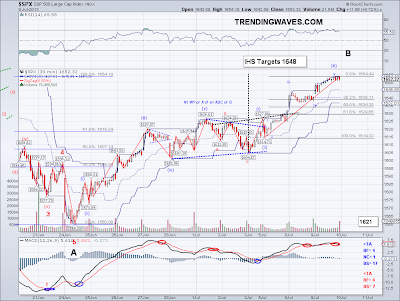 There is resistance at 1646-48 so if that area breaks we could see the market go for 1654 and create the perfect neckline of bigger IHS targeting 1750. Earnings season is here so maybe this will be the factor that will used to continue the rally or put in one more intermediate bearish leg to finish the correction. I will be position trading tomorrow and shorting in expectation of a neckline but obviously I will be quick to take profits with shorts as it seems like the right trade is on the long side as long as the indicators are bullish. The market broke out of its triangle from the cash market and as I had speculated couple of days ago the right angled triangle formation made the higher high and closed the 1626-1630 gap (finally). The market also seemed to have put in a quick W2 earlier in the morning and an Inverse Head and Shoulders targeting 1648 was also formed, so given all the other bullish factors in place (bullish short term trend, above 50 dma close, bullish MACD crossover) it looks like the market is about to get very bullish early next week. 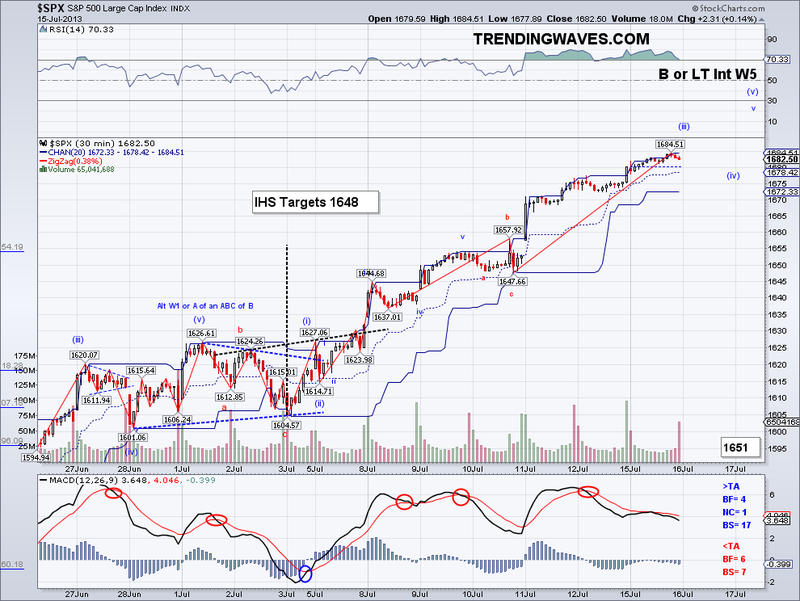 The count I have on the IHS targets 1660's more or less so maybe that will be a good spot to hedge or short and I think the next intermediate wave will either confirm 1560 as the low for the correction or put in the low on a C of Y wave of an double Zig Zag. It will come down to how the 50 day ma holds on the correction, enough time has passed by for bears to make their case and after 7 weeks of trying there hasn't been much of an bearish advance. But this comes as no surprise as all of this had been anticipated in the Long Term chart I posted couple of months ago (I put the labels then in anticipation of the market topping then). But before we get too far ahead of ourselves, let's see how next week trades. I tried improving my FXI position but ended the day even, looking to sell it to position trade when the targets are met and go short. The market gapped down today in the cash market but still remained in the triangle pattern as it failed to make a lower low. The test of the 1597-1601 area that I was hoping for did not come in regular trading hours but again in pre-market trading and the pattern it left is actually more bullish than the triangle in the cash market. So I put up a chart of the ES trading for the last few days so you can see what I am talking about as the cash market chart show only one test of support. The pattern is a right angled triangle with three bearish attempts to break the equivalent of the 1597-1601 low, so given the fact this last attempt could not break support there is now a good chance for the market to close the 1626-30 gap as soon as Friday. Also, the short term trend has now turned bullish and the daily MACD has officially done a bullish cross so unless there's some sort of negative surprise in the next day or two, the path of least resistance is up. We will get the jobs report on Friday and that could be used as an excuse to rally as a weak jobs number could be interpreted as more QE and a strong jobs number as a sign of the economy picking up, a win/win situation as far as using an excuse to move the market. I ended up position trading my FXI position for some improvement and perhaps I'll get a chance to trade again on Friday if I see a good set up. The market has technically continued its correction from the 1626 high but it seems to be triangulating, so we should expect a break out of this formation soon. That unfilled gap seems to be a magnet and should the market hold 1597-1601 on another test then it is very likely the market will break out in a right angled triangle, similar to the one couple of months ago with the 1538,1539 and 1536 low. We don't see the 1597 test on the cash market but I am taking into account the low Sunday night so a third failed bearish attempt will be a good spot to go long imo (if that level breaks then I'm going long around 1575). The daily MACD is about to do a bullish cross and that favors a lasting rally, so perhaps the next Int bearish wave will either confirm 1560 as the low for the correction or possibly put in the final low. 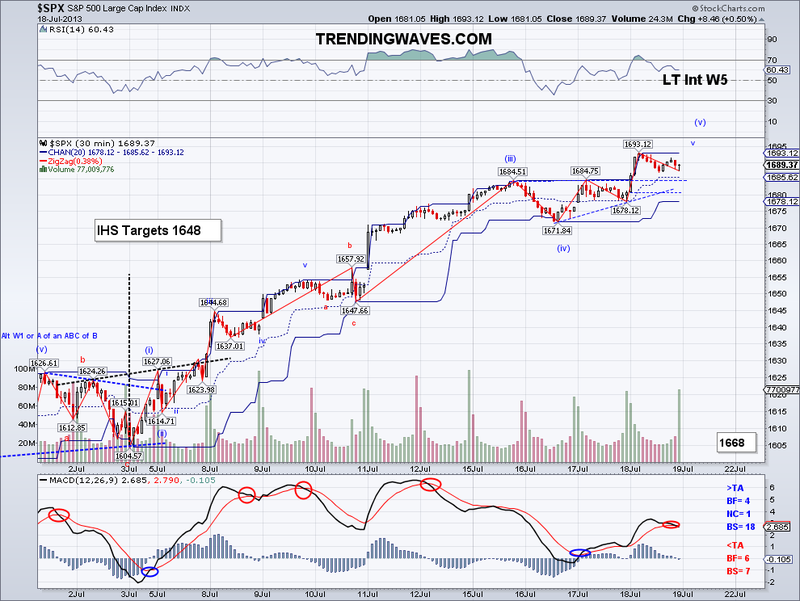 I shorted per my plans from yesterday at the 1623-1626 resistance and covered once a 5 wave formed on the micro count. And if I see a similar set up tomorrow I will be doing the same, I rather not risk overnight positions during this time. In fact, I prefer not to risk overnight positions ever if I can make similar gains like today trading intraday. 5 Waves technically completed but.. 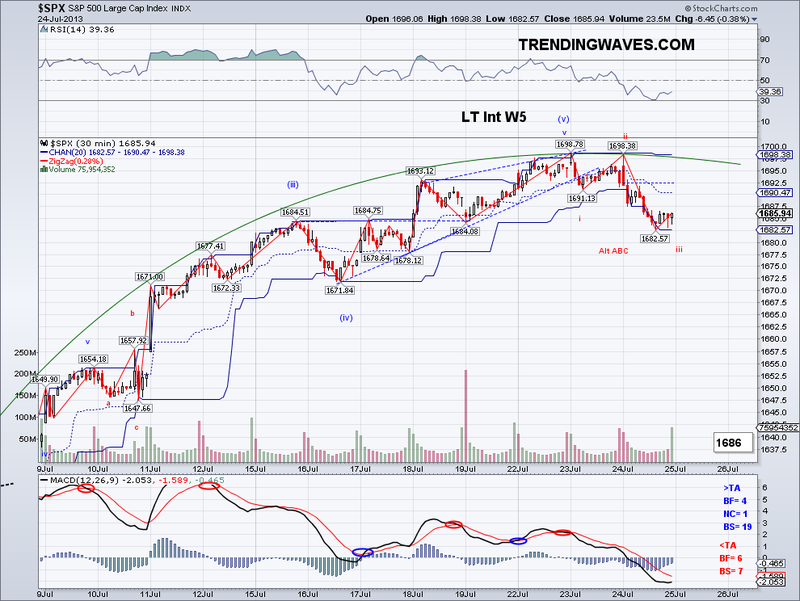 I have the market technically showing 5 waves completed from the 1560 low and the targets I had for this wave which were the 50 DMA, 1623-26 and the gap have all been met. In addition, the 5th wave from the W4 low of 1601 to the W5 high of 1626 is 25 points, which nearly identical to W1 which came in at 26 points. Now the problem with this completed count was the pre-market action, specifically the move Sunday night when futures moved to lower low on what would have counted as a C wave to the equivalent of 1597, the move I was expecting on my Friday post. 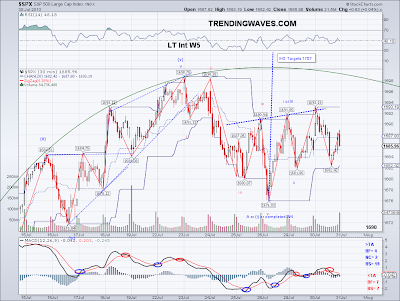 So if I take into consideration the completion of the C wave at 1597, the top today is just W1 of W5 and not W3 which is how the cash market reads. And since there is no rule written for this, I am going to log this and future instances of these cash vs pre-market counts and see what is normally the outcome as placing a trade under these conditions is a toss up. I found it unusual that the 1625-30 gap was not closed completely so I suspect the market might try again one more time. I did not place any trades as the count is not all that clear but I will be looking again at support and resistance levels for higher reward/lower risk trades. Also, the market has closed again over the TA and more upside (specially above the 50 DMA) will turn the short term trend bullish. Last but not least, I'll make a note to remember the Russell Reconstitution next year as it is a good spot to short right into the close as the market gets flooded with shares.